It was about five years ago that I realized my great love of paintings. I happened to be visiting my dear friends in Chicago for a few days and managed (mainly at their insistence) to squeeze in a visit to the famous Art Institute of Chicago. Now, don't get me wrong, I've always loved paintings, but coming face-to-face with ten-foot canvases infused with colour and emotion and history was mesmerizing. And so when I came across this book: 149 Paintings You Really Need to See in Europe by Julian Porter, I had to pay attention. Travelling can be fun, but travelling on a time schedule makes things difficult to plan. On my last trip to Barcelona a few years ago, I made it a special point to see the Picasso Museum. Yes, Pablo Picasso is one of my favourite modern abstract artists, and despite the hour long line up, this display of some of the finest works of a brilliant artist did not disappoint. The book unfortunately focuses on the best paintings by artists during the period 1298 to 1937, and so a lot of Picasso's newer works have not been included. Regardless, I look forward to a new book in the near future by the author who acknowledges this limitation. I digress from my point: I love paintings. But I don't know enough of their history, much less the history of the times when they were created. But, I'd love to know. And because I have a terrible memory for these kinds of things, it's nice to have a bit of a guide. Even more importantly, I know that when I travel to Europe again, I have only a limited amount of time allotted to sightseeing. After all, I've lots of other great things to do. The foodie in my won't let me leave without trying out the local cuisine, and the shopaholic in me won't let me leave without browsing for hours. So, I must be prepared to cram all the art I can into my limited time, and 149 Paintings You Really Need To See in Europe is the perfect companion to help me paint my perfect vacation canvas. Did you know the Guernica was done in only four weeks? Twenty-seven metres of canvas, all black, white and grey. He experimented with colour but the final work eliminated it. It was Picasso's contribution to the Republican cause and paid for by the government. "The painting is a black and white image of torture, LSD dreams, and electric shock, your mental finger wetted up and jammed into the live socket white your feet are in water. The figures are unrealistic, part absurd. Is war anything but?" To really look at a painting takes time and knowing a bit about the story behind the painting offers great understanding and satisfaction. Wish I had researched a bit more about the artists and history during my recent visit to the Art Gallery of Ontario to witness The Great Upheaval: Masterpieces from the Guggenheim Collection, 1910-1918. If you happen to be in Toronto, you only have until March 1st to check out The Great Upheaval: Masterpieces from the Guggenheim Collection, 1910-1918. You won't be disappointed with these paintings featuring Constantin Brancusi, Marc Chagall, Vasily Kandinsky, Henri Matisse, Pablo Picasso, among others. The exhibition chronologically traces the achievements of these tumultuous years as artists experimented with new ways to create art while launching such movements as expressionism, futurism and cubism. 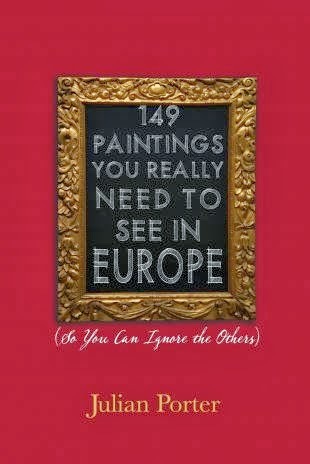 149 Paintings You Really Need to See in Europe by Julian Porter, is published by Dundurn Press.